Two days after Rush Limbaugh's record- breaking contract renewal deal was announced, his mainstream media and blogospheric enemies have continued to crank up the smear machine. While others enjoy the Independence Day holiday weekend, "progressives" continue to unleash their fury over the stunning agreement, which includes a nine- figure advance payment. Though we had highlighted examples of anti- Rush vitriol yesterday, today brings a fresh batch of unhinged antics, with the sources of that rage proving not always as predictable as one might think. Ah, there’s nothing like the smell of $400 million in the morning. This is the amount Rush Limbaugh will be paid via Clear Channel for his continued service to this country -- not including an additional $100 million signing bonus. The deal continues Clear Channel’s quest to lower radio standards to the point where there will be only talk radio and Top 40 stations on the radio. On the plus side, Howard Stern still remains the highest paid radio personality of all time. It’s good to see that America still has standards in that it values a man who has made a career out of getting women to take their clothes off over one who has made a career out of being wrong and making ridiculous statements. Not only has Limbaugh made a career out of thinking he’s the voice of reason, but he’s done so while contradicting himself and making outrageous and/or distasteful claims along the way. One incident came in 2003 when Limbaugh admitted to abusing prescription drugs and later sought help for his “problem.” This came after Limbaugh’s repeated attacks on drug abusers and insistence that they be treated as criminals. He has said, “Too many whites are getting away with drug use...Too many whites are getting away with drug sales...The answer is to go out and find the ones who are getting away with it, convict them, and send them up the river, too." Ah, and who can forget Limbaugh when he shed light on the Abu Ghraib scandal. Hey, Rush, you ever heard of torture? Yeah, I’m talking about when people are held against their will and physically or psychologically abused in order to get information out of them. 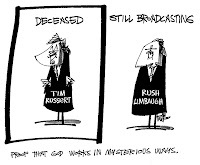 Perhaps Rush should be hooded, stripped naked and then smeared with blood. Oh, and afterwards people should be able to take pictures with him. In fact, Rush could go on tour in support of emotional release. 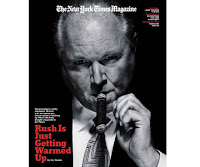 It could be touted as the “Rushing to abuse Limbaugh tour 2008.” After all, everyone needs to blow off some steam. Another classic Rush moment came when he accused actor Michael J. Fox of exaggerating the effects of the debilitating Parkinson’s disease for political purposes during Claire McCaskill’s campaign. “He is exaggerating the effects of the disease. He's moving all around and shaking and it's purely an act. ... This is really shameless of Michael J. Fox. Either he didn't take his medication or he's acting." No Rush, what’s shameless is that you would accuse a man with a degenerative disease that he is faking the effects of a degenerative disease. What’s next, will he attack cancer victims for exaggerating hair loss due to chemo therapy? Actually, I probably shouldn’t give him any ideas, but then again he’s not listening anyway. Though when Rush talks, people listen. This emotional tirade comes just weeks after an editorial cartoon in the Star (shown in the top- right corner) wished for Rush's death in the wake of Tim Russert's passing. By Josh Board | Posted July 4, 2008, 1:46 a.m. Rush Limbaugh and Bret Favre are both idiots. But there are a lot of differences between the two of them. Limbaugh is out of shape. And, has no talent. I'm not saying that because I don't agree with his views on anything. Even if you're a Republican, you really have to admit, this guy is a windbag. And, his voice. Who can really listen to such an irritating voice? Why is it people have a hard time admitting someone is annoying, when they agree with them politically? ClearChannel Come Clean: Was Limbaugh on McClellan's Fax List? Many still do not know the details of how the right wing radio complex came into being, a by-product of consolidation and deregulation which has made the U.S., armed with less accurate information and reporting, into a bitterly divided country. Learn how the landscape was tailored for Limbaugh and then speak up - do you feel biggest radio broadcaster in the country has a responsibility to fully disclose major political news and information? Has he been in contact with the White House? And for you "Conservatives", a challenge - has Rush Limbaugh's support for the GOP helped bring about smaller government, fiscal responsibility and strict ethics - or just the opposite? What then, is conservatism based on today? If you're a parent like me, you might feel embarrassed by the lack of integrity in America's #1 talk radio show, unrepresentative of most Americans, it pumps up the pro-war, pro-business rhetoric that best supports the neo-con hustle. Let them know today what you think about the $400 million reward for their lopsided, incomplete daily infomercial, but more importantly - has there been illegal collusion? In most bars Rush Limbaugh would get his a** whipped after a few minutes of sharing his two cent's worth with his fellow bar flies. But in this absurd world that we live in, this clown gets paid an insane amount of loot for haranguing his listeners for hours a day. After Limbaugh buys a mountain of Viagra and OxyContin, what's he going to do with the rest of his loot? You couldn't pay me $400 million to listen to Limbaugh on a daily basis, he's annoying, crude, petty and disgusting. Comedian and aspiring politician, Al Franken, captured the essence of Limbaugh is the title of his best-selling book, "Rush Limbaugh Is a Big Fat Idiot." Judging by what we've seen so far, don't expect the left to cool down anytime soon. This one really burned them. You dish out, Brian, but you can't take it. Apparently in your world you are the only one who can engage in "smear," "fury" and "vitriol." Did you see the article in the Times on "moral hypocrisy" last week. Foolish question. Of course you didn't. My eyes, my eyes. Please, anything but that.